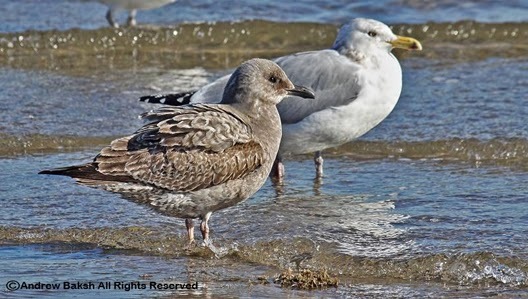 A familiar term often heard from some birders who tried their hand at Gulls, this is synonymous with the same comment reserved for shorebirds. Gulling my dear readers, is the frontier for those crazy masochistic birders who don't mind the feeling of being humbled time and again in their pursuit of trying to understand (snicker) the various gull plumage. Yes, I have joined the crazies working harder at it this year all the while enjoying the challenge. Did I say crazy? It is going to be a long, long process as I continue to learn but I am taking small steps and really working on the common species like Ring-billed and Herring Gulls. The latter, is already giving me quite the work over in terms of getting the aging correct. Every time I have a candidate that I think might be of interest to readers, I will share my pitfalls and what I have learned so that you too could learn. You know what they say, "misery loves company". Here is a bird recently photographed in Rockaway Queens NY. The impression I got when I saw this bird was whoa! What do we have here? A 1st cycle Herring Gull or...? But wait the bill is all black and the bird looked small. I allowed Thayer's Gull to creep into my head but I did not allow "raritis" to take over. Instead I concluded it looked good for a small female 1st cycle Herring Gull. Unfortunately for me, my camera battery died and (hangs head in shame), I had not charged my backup since it had died. So when this bird took off I regrettably could not get any flight shots.